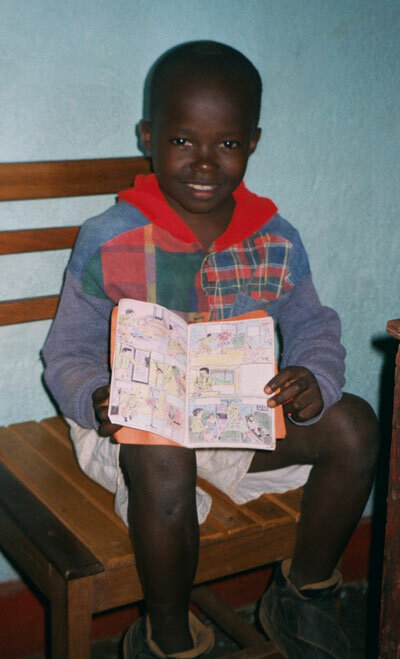 Ombeni was 11 when we first met him in Bagira village where he was attending primary school. We were shown his drawings of cartoons and his making of children stories in little books which he would sell to his friends for a few pennies. This was a child who had had no access to books, TV or education materials, and yet he was able to invent a story from scratch, and draw cartoons to illustrate it, very similar to the “Tintin “ adventure books. Each cartoon picture was painstackilly painted by him , with the most finite care and precision. It was amazing! We were very impressed by his skills and we decided to include him in our sponsorship programme. Ombeni came from a family of 16 children ( his father was a polygamist and had left his mother in charge of 8 of them!) and had little chance of making it to secondary school or of achieving any of his ambitions. 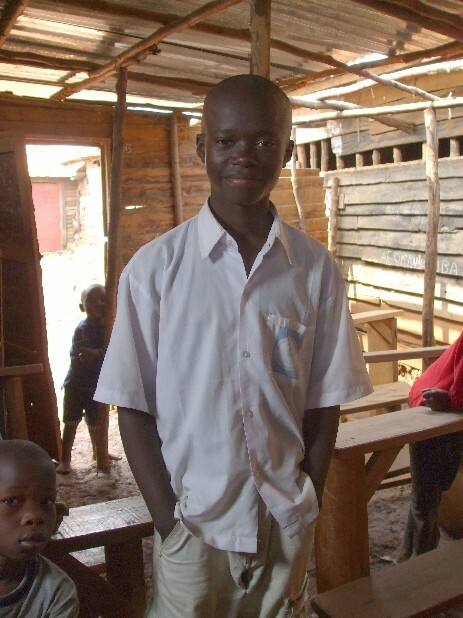 Ombeni received the help of one of our sponsors, who subsidised his schooling for 9 years. He continued to excel in most subjects, including art of course, in which he was doing brilliantly. But now aged 21, Ombeni is a realist. He has decided not to become an artist because of the lack of real opportunities in his country, and the need to survive and eat on a daily basis, rather thanto achieve fame. “ I am now in my second year at university where I am studying for a management degree in social organisations. I am grateful for the help I continue to receive from Congo Action , since my mother would not have been able to pay for my secondary school, and university was out of the question. I am still passionate for art and I design and paint publicity posters for shops and small businesses. This provides me with a little money to supplement my studies and living expenses.